The PK 360, with the teak shelves and sleek lines, are a nice addition to your grilling line up! 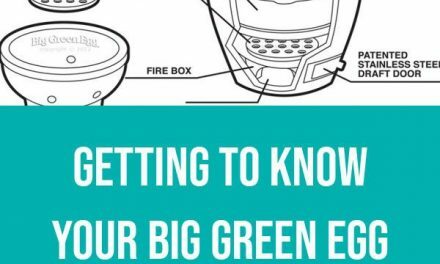 The PK (Portable Kitchen) Grill is relatively “NEW” to the market, but that is only figuratively speaking, in that the brand has been around since the 50s, and chances are you can still find an original PK if you look hard enough because they seem to last just about forever. And this is how they came to be a classic yet new grill on the market- the PK grill design and brand was resurrected by a group of smart people who recognized their great design and brought the brand back to life. 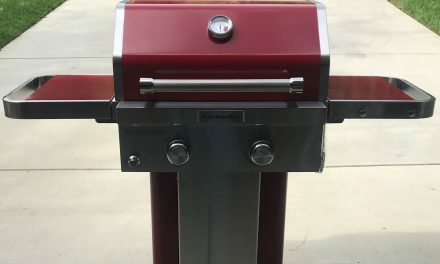 You can read all about how the PK grill was resurrected into the modern day grilling brand it is now on their website, but the proof of their durability can be seen by their first generation models that are still around today. 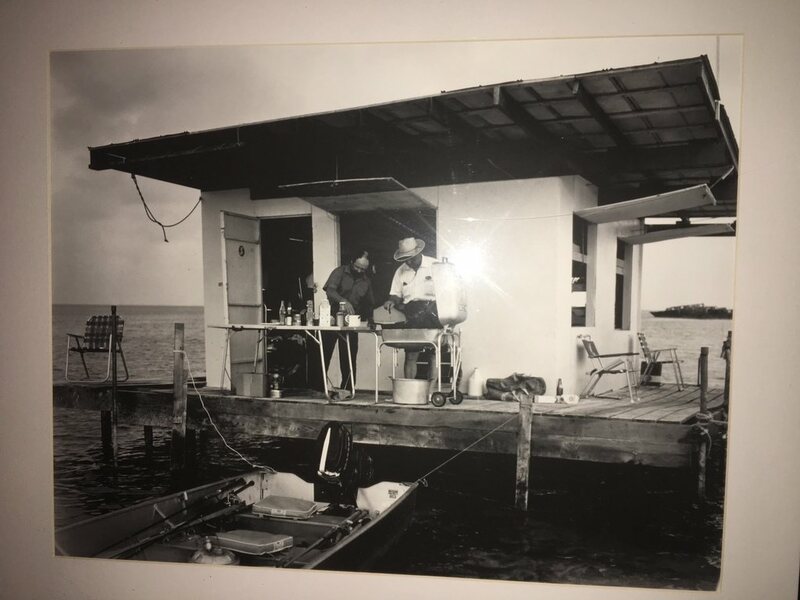 This is a pic I saw at Jimmy Buffet’s Steak house at his Margaritaville resort near my house. This is an old fish shack in the Keys from around the ’50s and check out what grill they have! What a find!!! 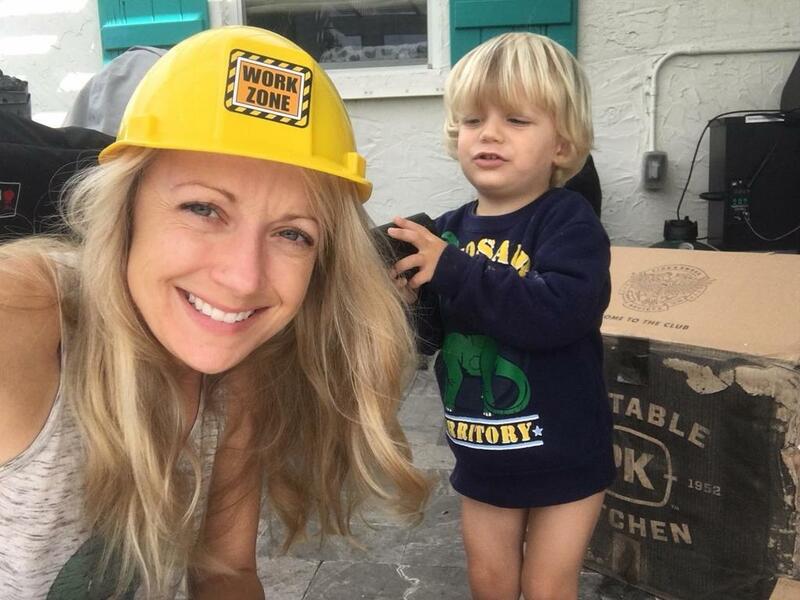 Hunter and I played “Bob the Builder” and put the PK 360 together one afternoon. He had fun making a train out of the boxes. The set up of the PK 360 was really easy, aside from a few brain farts that were entirely my fault, the average person should be able to put this grill together in about an hour (or according to some peoples’ time lines, approximately 3 beers). I put this grill together with my 2 ½ year old and doing projects with toddlers can often be counterproductive so this shows you how easy it was. Hunter had fun making a “train” and a house out of the boxes during the assembly process. 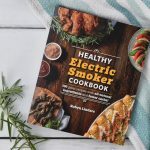 The grilling chamber is rectangle in nature which I like as it makes it very easy to create distinct direct and indirect zones for grilling and smoking. 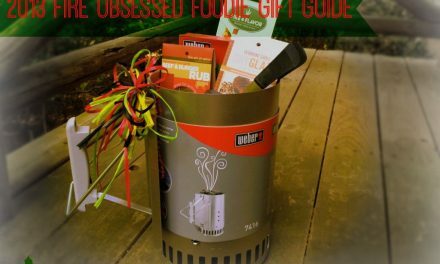 The grilling chamber is made of Cast Aluminum which is awesome for heat retention and helping reduce charcoal consumption. 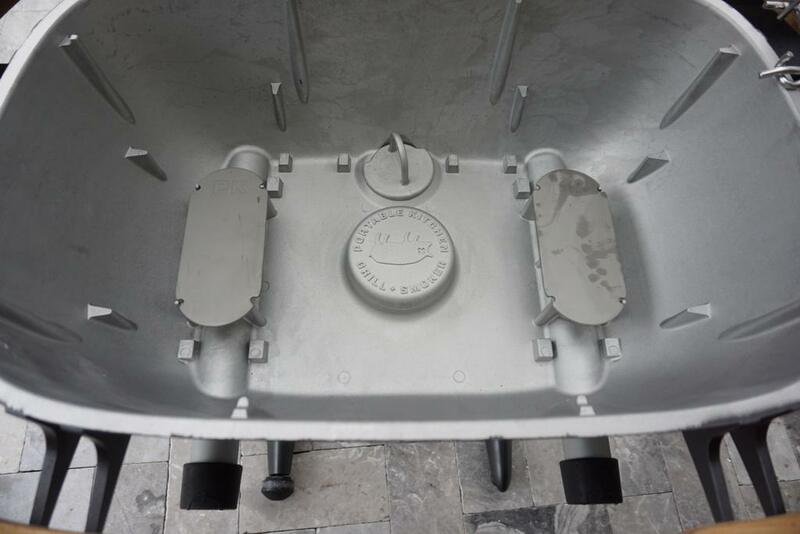 The top of the grilling compartment chamber seamless fits onto the bottom and hinges with no additional parts which is a really brilliant idea as there are no parts that can rust or need replacing over time. 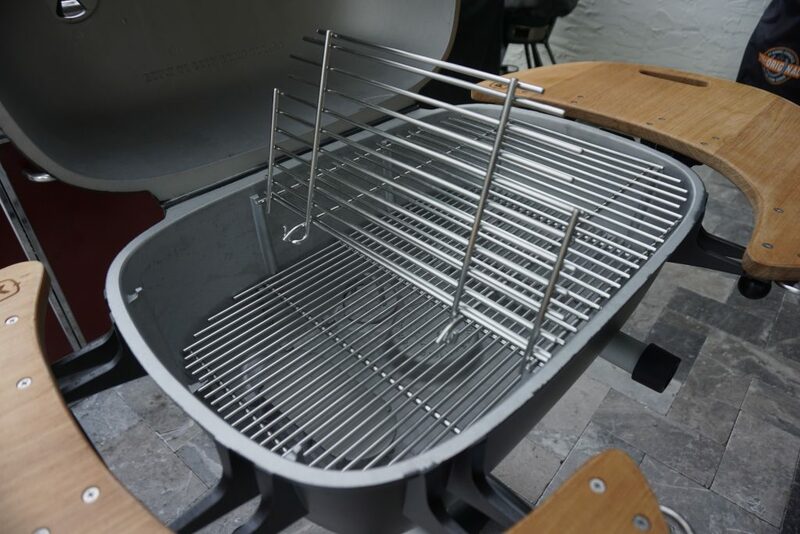 The PK 360 has marine grade stainless steel grill grates that are hinged for easily adding more charcoal. 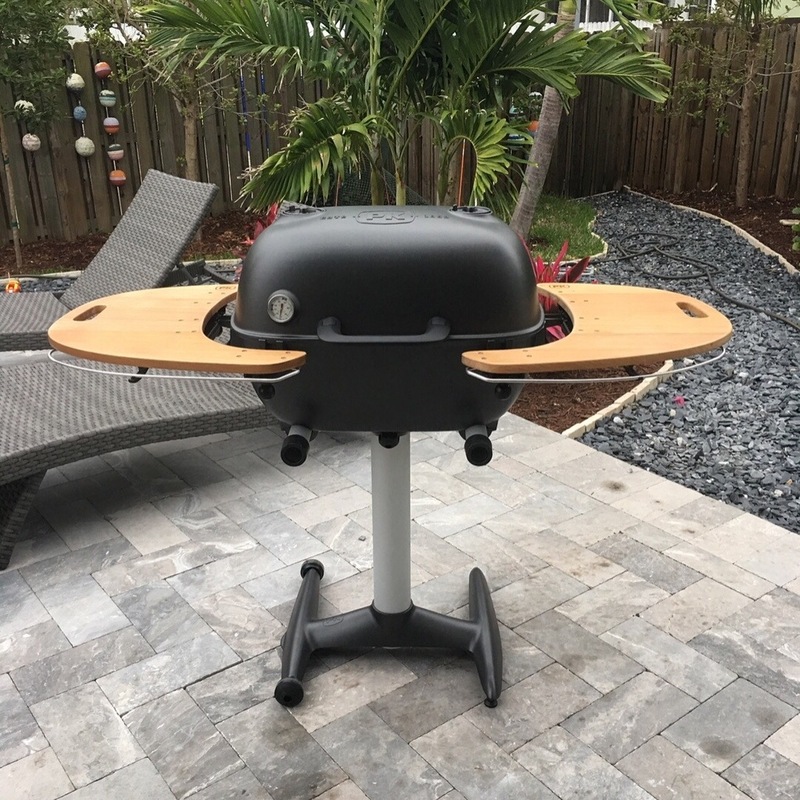 The PK 360 comes with 360 square inches of grilling surface which is great for grilling and smoking flexibility- you have plenty of room for creating zones as well as loading the grill up for a grilling session for lots of people. 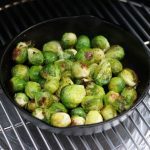 It comes with marine grade steel grill grates that are hinged for adding charcoal, which is a nice feature, however you have to get the hang of how it works as it can be tricky when wearing heat resistant gloves. But the idea is smart. The back of the grilling chamber comes with knobs to hold grilling accessories which is smart and also keeps them out of site, saving space on your shelves for other things. 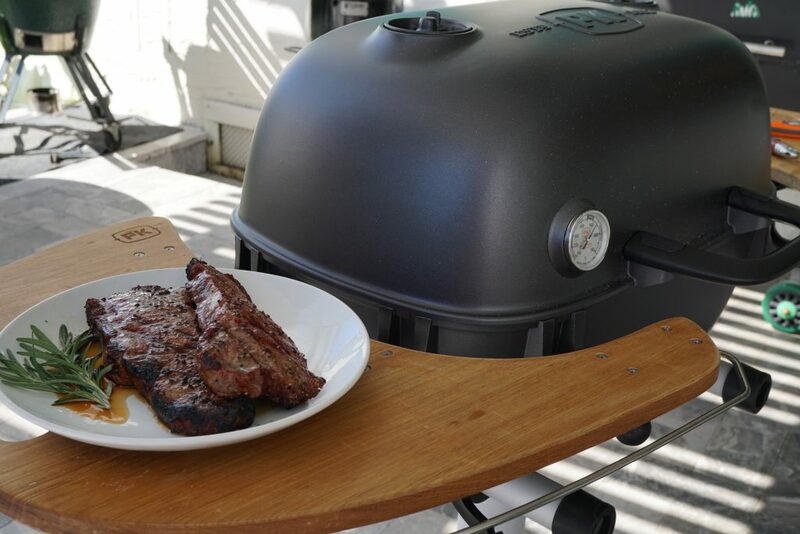 The Grilling Chamber/compartment sits on top of a metal base that attaches to two wheels that make the grill easy to move around your backyard. The chamber also detaches from the base in the case you want to take your PK on the go with you for tailgating or camping, for example. The design offers ample cooking space on the grill but is small enough that it doesn’t take up too much space in your patio or backyard. This is great for those with smaller spaces. This picture is taken looking at the grill from above- you can see where the ashes dump out via the “plug” at the bottom, and the air vents have covers so they don’t get ash in them. There are two ventilation “tubes” at the bottom for ventilating the grill. 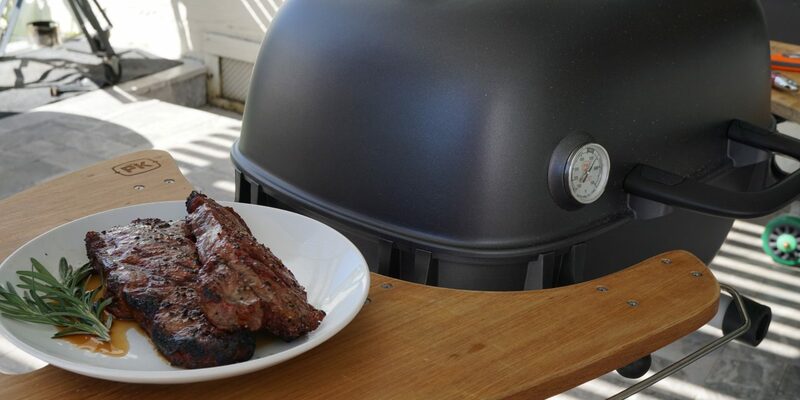 When facing the grill, the tubes can be moved in circular fashion to open and close the vents. The ventilation holes have metal plates that go on top of them to keep charcoal from getting in and clogging them. There are also two ventilation caps at the top of the chamber, for circulating air between the two zones. There is a big “plug” at the bottom that can be opened for emptying the ashes. You can buy a metal bucket from PK for ash disposal. The bucket does not come with the grill and is sold separately. My husband found the ash clean out rather cumbersome but that may be because it is different than what we are used to with other grills. 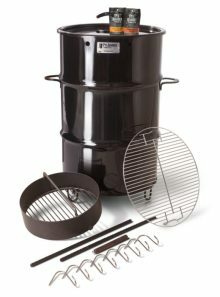 With our Weber Performer there is an attached ash catcher that automatically catches the ashes and can be dumped out when it is full. I don’t think there is anything wrong with the process of ash removal for the PK, I think it is just different than what we are used to. The best way to tackle ashes is a trick I learned from my dad- buy a mini wet dry vac, the kind they sell for washing cars- this is the perfect tool for cleaning grills. Cleaning your grills on a regular basis will help with maintenance over time as well as the longevity of your grill. 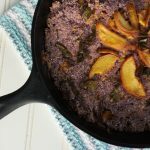 The PK grill cooks fantastic! It maintains heat very well, obtains nice char marks, and your charcoal lasts a long time due to its heat retention. So far, I have cooked steaks multiple times, grilled romaine salad, a cobbler, and pork chops and they all came out great. I have yet to smoke anything on the PK but I think the heat retention from the cast aluminum would be a plus for maintaining temperatures. The PK 360 is offered at $899. 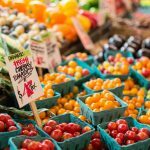 They can be purchased online or at participating retailers. Would I recommend this grill for someone? Absolutely. 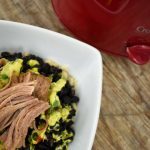 I think this is a great grill for anyone who wants to embrace charcoal grilling, especially for those who are just entering the world of charcoal and want something easy to use, smartly designed, easy on the eyes, and portable for grilling on the go. The price point is higher than other charcoal grills in its space, but the original PK grills from the 50s are a testament to their durability. 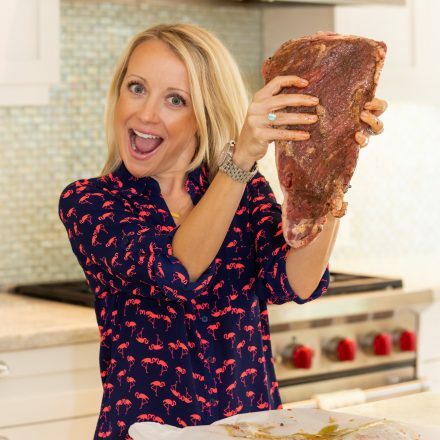 Think of this as a solid investment in your grilling future. 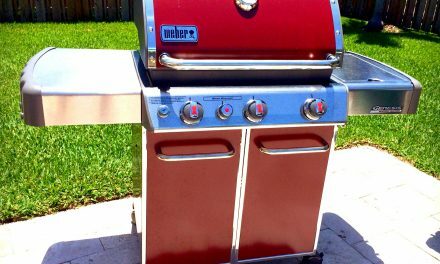 If you want to get a PK grill, you can buy the original, entry level model that has a slightly different configuration and one side table for a price of $369 but it doesn’t come with any extras like a thermometer. 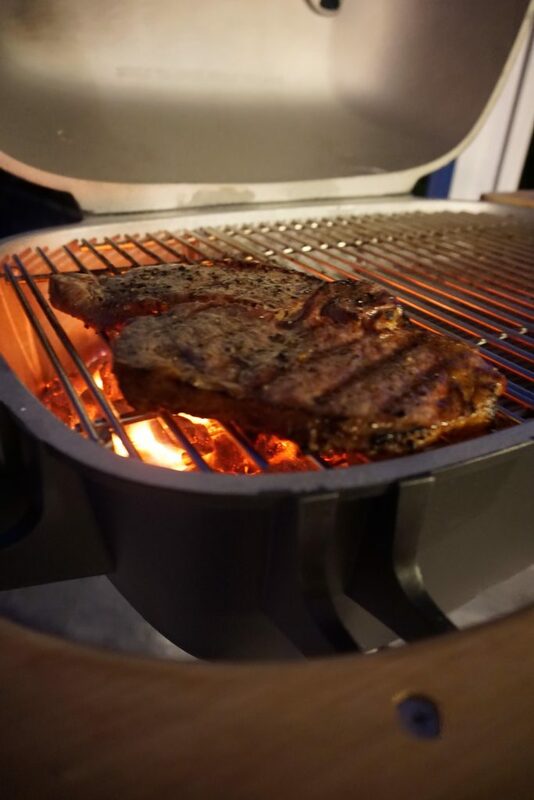 If you can swing it, the design and look and feel of the PK 360 commands a presence in your backyard, and has nice upgrades that make for a great grilling experience. Note, this grill was offered in exchange for an honest review. HI Peter are you looking to get the performer with the gas starter? 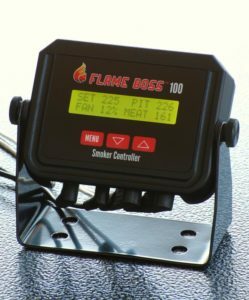 I have both and I have to say the Performer with the gas started has been my favorite grill for a long time because the convenience of using the starter to get my coals going. But, my weber kettle is older and I have heard the quality of weber has gone down over the years so if you are looking for a longterm investment in a charcoal grill the PK will last just about forever!!! And the way it is made does offer superior heat retention.